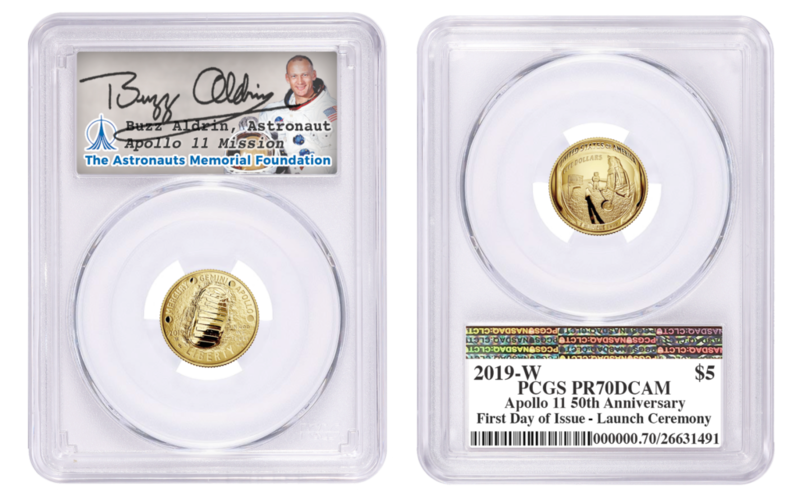 The United States Mint has created a gold, silver and clad curved coin to commemorate the 50th Anniversary of the Apollo 11 lunar landing and it is out of this world! 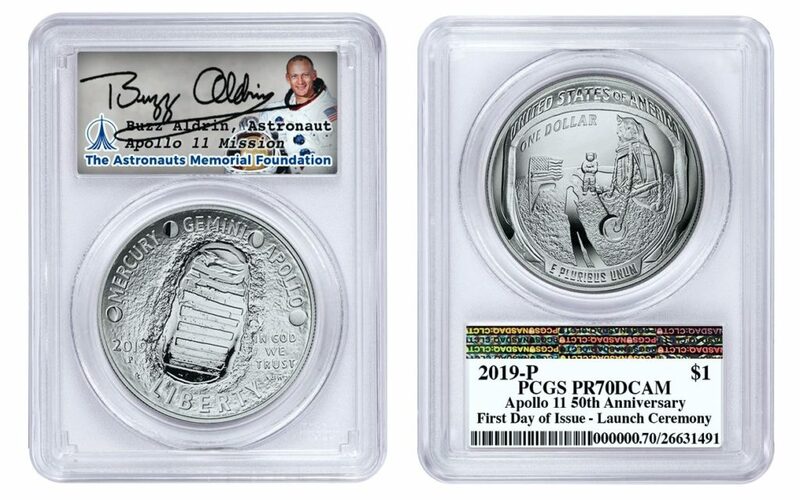 Buzz Aldrin Ventures has partnered with the Astronauts Memorial Foundation, one of the US Mint official recipients, to pair a limited number of first strike 2019, Apollo 11 50th Anniversary coins with a signed certificate by Buzz Aldrin, and an official authentication from PCGS, all encased in an exclusive presentation! About the Coins: Under Public Law 114-282, Congress directed the U.S. Mint to produce and issue up to 50,000 $5 gold coins, 400,000 silver dollars, 750,000 clad half dollars and 100,000 five-ounce $1 silver coins to commemorate the 50th anniversary of the first manned moon landing. This first-day issue, proof, $5 dollar gold coin is composed of 90 percent gold, six percent silver and the balance copper and has been limited to a 50,000 mintage across all gold product options. This five-ounce, Silver Dollar Proof Coin is the first of its kind – the only US coin to be made with a proof finish, reeded edge, and curved shape. What better way to celebrate the first manned Moon landing which occurred July 20, 1969! This one-ounce, Silver Dollar Proof Coin, has a combined maximum mintage of 400,000 pieces. It bears the “P” mint mark of the Philadelphia Mint and comes in proof (PR70) condition. The Apollo XI 50th Anniversary Commemorative Coin Act authorized the production of a $5 gold, a $1 silver, and a half dollar clad coin, all in Proof and Uncirculated versions. It also calls for the production of the five-ounce silver coin in Proof. The .900 fine gold coin, struck at West Point, weighs 8.359 grams and has a diameter of 21.59 mm (0.85 in). The 26.73 gram silver dollar, struck at the Philadelphia Mint, has a fineness of .999 pure silver (a first) and a diameter of 38.10 mm (1.50 in). The clad half dollar weighs 11.34 grams and has a diameter of 30.607 mm (1.205 in); Proofs were struck at San Francisco, while Uncirculated half dollars were struck at the Denver Mint. And perhaps the most distinctive trait of the coin is its concave obverse and convex reverse. Ron Harrigal, manager of the US Mint’s design and engraving division, said die preparation proved to be quite the challenge to execute the curved features. The Mins started with the 3-inch coin first and then adapted the findings to the smaller diameter coins. Harrigal said each of the obverse and reverse dies were engraved individually on CNC cutting machinery and hand-finished, essentially making master dies into working dies, eliminating any hubbing. 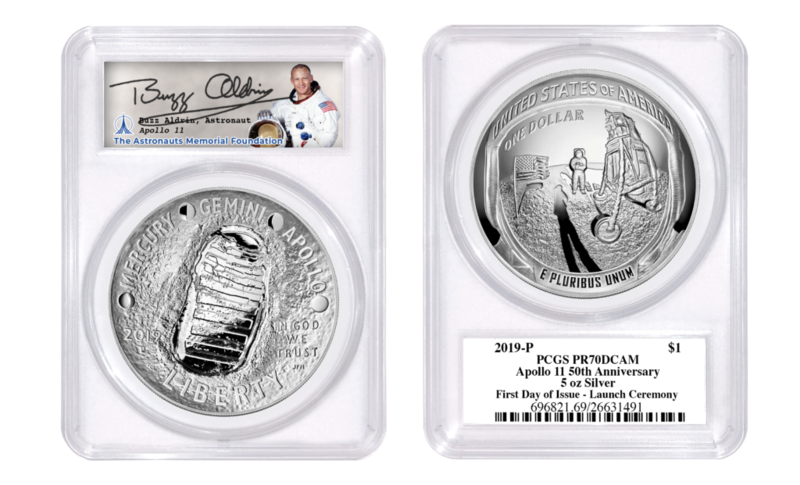 The obverse design features inscriptions commemorating each of NASA’s Lunar missions, “MERCURY,” “GEMIINI,” and finally “APOLLO,” separated by depictions of phases of the moon in between each phase of NASA’s Lunar Missions to represent the lead up to the first manned Moon landing. A depiction of Neil Armstrong’s footprint on the lunar surface is the main feature of one side of the coin along with the additional inscriptions of “IN GOD WE TRUST,” and “LIBERTY.” The obverse was designed by Gary Cooper, an artist and sculptor based out of Belfast, Maine. His design was chosen as the winner of the Mint’s design contest for the program. The reverse side’s design features a representation of a close-up of the famous “Buzz Aldrin on the Moon” photograph taken July 20, 1969, which shows the reflection of the visor of Buzz’s helmet with Neil Armstrong, the United States flag, and the lunar lander in the foreground.